Following a long recovery process, a public shaming, and a victory in arbitration last week, sushi-poisoned Broadway star Jeremy Piven is back, sort of! He was on Letterman last night to further explain his departure from last year’s Speed-the-Plow to a skeptical Dave. He acknowledged that mercury poisoning might seem like “a rich man’s disease … like something you might get from the leather seats in your Lamborghini,” to much laughter and applause. 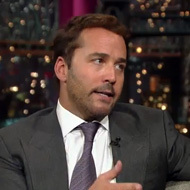 But things quickly turned serious: “A cardiologist of almost 30 years said, ‘Here’s the deal,’ ” Piven recalled. ” ‘You can’t go back and do eight shows a week, you simply can’t … unless you want to have a heart attack.’ ” Luckily, he did the right thing and quit immediately, leaving producers and cast mates in the lurch. While you’re waiting for the inevitable follow-up press release from the National Fisheries Institute, click to watch the video!